Exciting new products have been added to the Pennys & Stamps shop...watercolour prints! 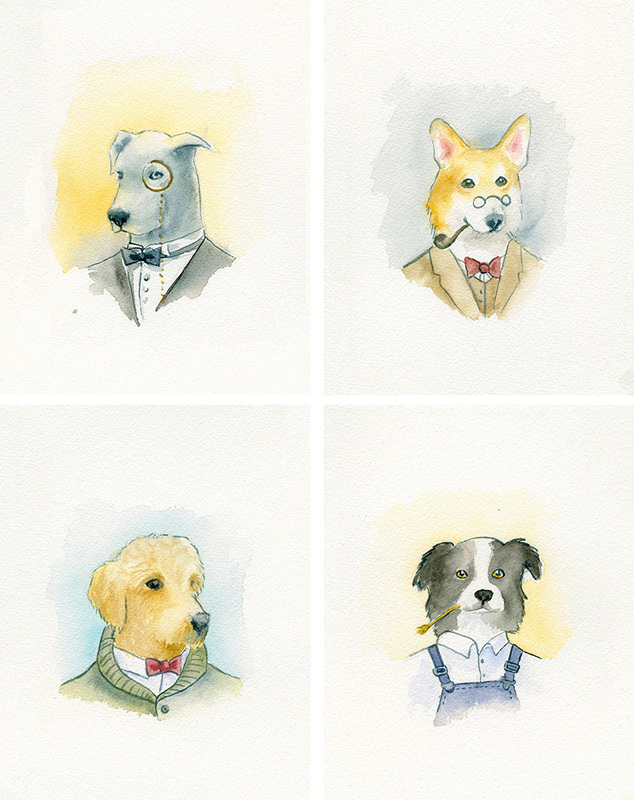 Each print is created on a 8.5x11 sheet of Hahnemuhle photo rag and was painted to showcase the traits we love most about our favorite dog breeds. Framing is optional and, if selected, you will be surprised with a hand picked, locally sourced frame. Head over to the store to take a look at what breeds are currently available and keep checking back as new paintings will be continuously added. Edward was described to me as wild, crazy, smart, friendly, and sometimes...maybe sometimes... just a little bit bad. Henry was considered the "angel baby". Kind and easy going. Lovable beyond belief. So, naturally, Edward became the epitome of the charming bad boy; Steve Mcqueen. His look was formed around a classic image of Steve Mcqueen in a black turtleneck sweater, eyes shaded by sunglasses. While looking through images of Edward I noticed he is never without his goofy grin so, of course, that needed to be added as well. While Edwards look came quickly, Henry took more thought. I painted him with a stoic gaze and classic JFK wear-- simple suit jacket, white shirt, blue tie. He struck me as a charming dog, with his lovable face and calm demeanor. It seemed only natural to have his look influenced by one of the most loved and most intriguing figures of American politics. To me, Edward and Henry seem like the perfect pair. Completely complementary, total opposites. More exciting news for the Holidays! Any order placed for an 11x14, 16x20, or 24x24 Pennys and Stamps custom painting will include a special gift basket with goodies from Pupcakes, Bits and Pieces and Pennys and Stamps! 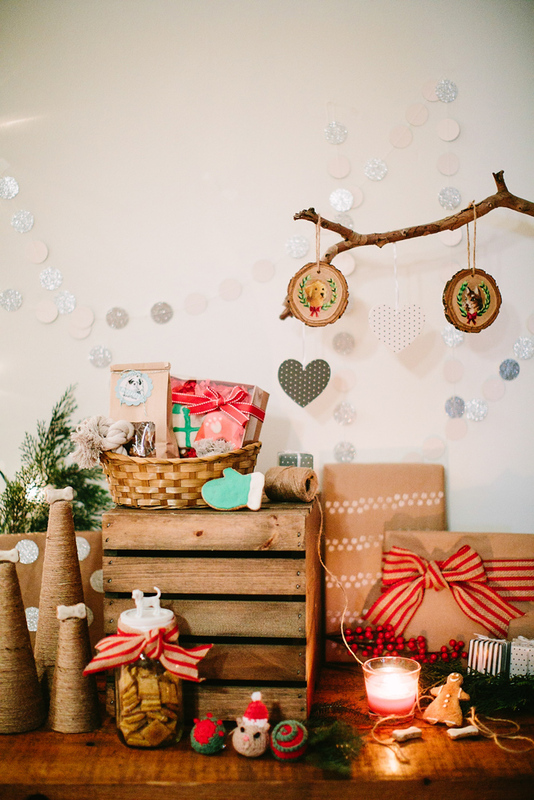 Each wicker gift basket comes brimming with treats; a box of 6 festive cookies, a 1/2 pound bag of treats of your choice, a rope toy, and a custom christmas ornament. To see the full description head over to the listing on the Pupcakes Bits and Pieces website. This offer is only available between November 15th-December 5th! 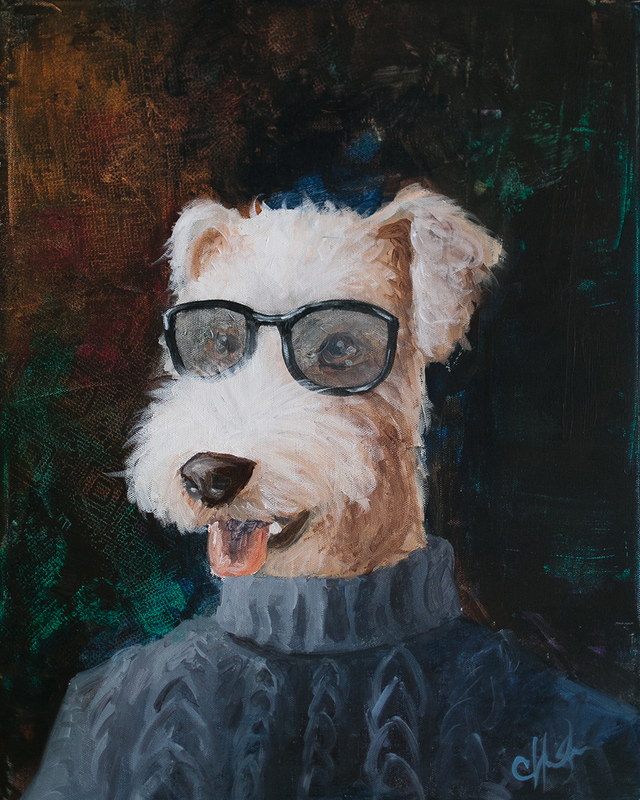 Mention "PUPCAKES" when purchasing a painting through the Pennys and Stamps Store. In our home, we adore our pets. We also adore the everything about the Holidays; christmas music, decorations, the whole nine yards. In honor of our Goldendoodle, Stamps, and our cat, Penny, I've created a new custom product to help include them in the Holiday spirit. In collaboration with my amazing friend Jackie from Pupcakes, Bits and Pieces I am now offering custom painted Holiday ornaments! Custom Holiday ornaments are available for commission in my shop and through the Pupcakes, Bits & Pieces store. Each ornament is carefully hand painted with a portrait of your pet surrounded by a festive wreath. 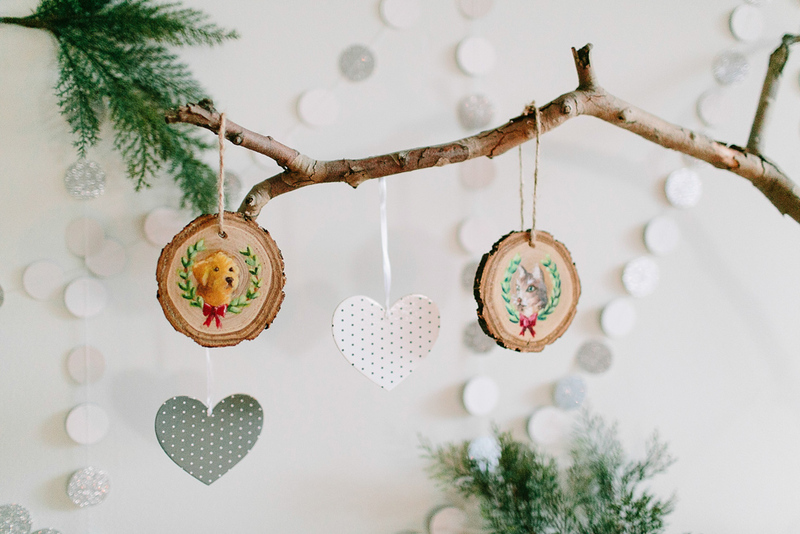 Every ornament is painted on a 4" round, locally sourced wood slice and completed with a twine hanger. So how do you get your own? Easy! Place an order through either store and send me a photo of your pet. Within a week you will be smiling while you hang your own custom ornament on your tree. Once you've started your Holiday celebrations with a custom ornament, check out the Pupcakes, Bits and Pieces store for amazing organic Holiday treats your cats and dogs will love. Don't forget to consider the Pupcakes, Bits & Pieces and Pennys & Stamps Gift Basket as a present for you favorite pets! Happy Holidays from Pennys & Stamps and Pupcakes, Bits & Pieces!